This article is about the statistical records of the Philadelphia Phillies. For their season-by-season win–loss records, see List of Philadelphia Phillies seasons. The Philadelphia Phillies have participated in 127 seasons in Major League Baseball since their inception in 1883. Through 2009, they have played 19,035 games, winning 9,035 and losing 10,162, for a winning percentage of .471. 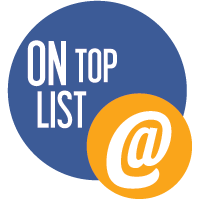 This list documents the superlative records and accomplishments of team members during their tenure as members of Major League Baseball’s National League. Chuck Klein, the franchise’s only batting Triple Crown winner, holds the most franchise records as of the end of the 2009 season, with eight, including career slugging percentage, career on-base plus slugging (OPS), and single-season extra-base hits. He is followed by Billy Hamilton, who holds seven records, including career batting average and the single-season runsrecord. Several Phillies hold National League and major league records. Pitcher/outfielder John Coleman is the most decorated in this category, holding three major league records, all from the franchise’s inaugural season. Coleman set records for losses, earned runs allowed, and hits allowed, all in 1883 when he also set three additional franchise pitching records. 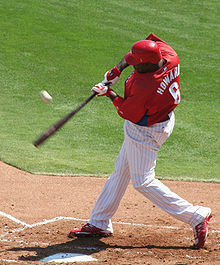 Shortstop Jimmy Rollins broke Willie Wilson‘s record for at-bats in a single season with 716 in 2007, and first baseman Ryan Howard also set the major league record for strikeouts in a single season that same year with 199, before it was broken by Mark Reynolds of the Arizona Diamondbacks the following year. The 1930 Phillies, who went 52–102, set two more National League records, allowing 1,993 hits and 1,193 runs in the regular season. 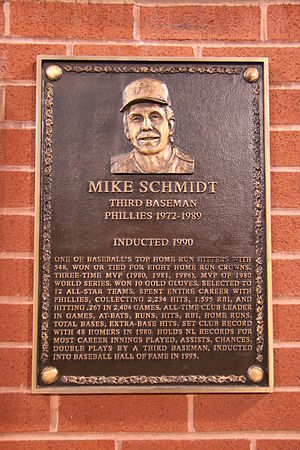 Mike Schmidt holds six career batting records for the Phillies franchise and played first base for the team on June 11, 1985, when it set several single-game records. Statistics are current through 2010 season; however, Phillies players whose careers have not concluded are not included in career statistics. All statistics in this section are drawn from Baseball Reference using the following sources: batting statistics; pitching statistics. Ed Delahanty, holder of three batting records for the Phillies franchise. All statistics in this section are drawn from the following source. a Earned run average is calculated as 9 × (ER ÷ IP), where ER is earned runs and IP is innings pitched. b Jimmy Rollins hit in 36 straight games up to and including the final game of 2005. Hitting streak in one season and hitting streak over two seasons are considered two separate records by Major League Baseball. After tallying hits in the first two games of 2006, Rollins’ streak officially ended at 38 over two seasons. “Philadelphia Phillies Team History”. Baseball Reference. Sports Reference LLC. http://www.baseball-reference.com/teams/PHI/. Retrieved 2008-08-19. ^ a b “Single Season Leaders & Records for Losses”. Baseball Reference. Sports Reference LLC. http://www.baseball-reference.com/leaders/L_season.shtml. Retrieved 2008-08-18. ^ a b “Single Season Leaders & Records for Earned Runs”. Baseball Reference. Sports Reference LLC. http://www.baseball-reference.com/leaders/ER_season.shtml. Retrieved 2008-08-18. ^ a b “Single Season Leaders & Records for Hits Allowed”. Baseball Reference. Sports Reference LLC. http://www.baseball-reference.com/leaders/H_p_season.shtml. Retrieved 2008-08-18. ^ “Single Season Leaders & Records for Strikeouts”. Baseball Reference. Sports Reference LLC. http://www.baseball-reference.com/leaders/SO_season.shtml. Retrieved 2008-08-18. ^ a b “Phillies Season Records”. Philadelphia Phillies. http://philadelphia.phillies.mlb.com/phi/history/season_records.jsp. Retrieved 2008-08-18. ^ a b “Philadelphia Phillies Batting Leaders”. Baseball Reference. Sports Reference LLC. http://www.baseball-reference.com/teams/PHI/leaders_bat.shtml. Retrieved 2008-08-18. ^ a b “Philadelphia Phillies Pitching Leaders”. Baseball Reference. Sports Reference LLC. http://www.baseball-reference.com/teams/PHI/leaders_pitch.shtml. Retrieved 2008-08-18. ^ a b c d e f “Billy Hamilton Statistics”. Baseball Reference. Sports Reference LLC. http://www.baseball-reference.com/h/hamilbi01.shtml. Retrieved 2008-08-18. ^ a b c d e f g h “Chuck Klein Statistics”. Baseball Reference. Sports Reference LLC. http://www.baseball-reference.com/k/kleinch01.shtml. Retrieved 2008-08-18. ^ a b c d e f “Mike Schmidt Statistics”. Baseball Reference. Sports Reference LLC. http://www.baseball-reference.com/s/schmimi01.shtml. Retrieved 2008-08-18. ^ a b “Richie Ashburn Statistics”. Baseball Reference. Sports Reference LLC. http://www.baseball-reference.com/a/ashburi01.shtml. Retrieved 2008-08-18. ^ a b c “Ed Delahanty Statistics”. Baseball Reference. Sports Reference LLC. http://www.baseball-reference.com/d/delahed01.shtml. Retrieved 2008-08-18. ^ a b c d e “Steve Carlton Statistics”. Baseball Reference. Sports Reference LLC. http://www.baseball-reference.com/c/carltst01.shtml. Retrieved 2008-08-18. ^ a b c d e “Robin Roberts Statistics”. Baseball Reference. Sports Reference LLC. http://www.baseball-reference.com/r/roberro01.shtml. Retrieved 2008-08-18. ^ a b c d “Pete Alexander Statistics”. Baseball Reference. Sports Reference LLC. http://www.baseball-reference.com/a/alexape01.shtml. Retrieved 2008-08-18. ^ “George McQuillan Statistics”. Baseball Reference. Sports Reference LLC. http://www.baseball-reference.com/m/mcquige01.shtml. Retrieved 2008-08-18. ^ a b “Jose Mesa Statistics”. Baseball Reference. Sports Reference LLC. http://www.baseball-reference.com/m/mesajo01.shtml. Retrieved 2008-08-18. ^ “Bill Duggleby Statistics”. Baseball Reference. Sports Reference LLC. http://www.baseball-reference.com/d/dugglbi01.shtml. Retrieved 2008-08-18. ^ a b “Ryan Howard Statistics”. Baseball Reference. Sports Reference LLC. http://www.baseball-reference.com/h/howarry01.shtml. Retrieved 2008-08-18. ^ “Single Season Leaders & Records for RBI”. Baseball Reference. Sports Reference LLC. http://www.baseball-reference.com/leaders/RBI_season.shtml. Retrieved 2008-08-18. ^ “Single-Season Leaders & Records for Runs”. Baseball Reference. Sports Reference LLC. http://www.baseball-reference.com/leaders/R_season.shtml. Retrieved 2008-11-13. ^ a b “Lefty O’Doul Statistics”. Baseball Reference. Sports Reference LLC. http://www.baseball-reference.com/o/o%27doule01.shtml. Retrieved 2008-08-18. ^ “Sam Thompson Statistics”. Baseball Reference. Sports Reference LLC. http://www.baseball-reference.com/t/thompsa01.shtml. Retrieved 2008-08-18. ^ “Phillies SS Rollins sets record for most at-bats”. CBC.ca. Canadian Broadcasting Corporation. 2008-09-28. http://www.cbc.ca/sports/baseball/story/2007/09/28/rollins-record.html?ref=rss. Retrieved 2008-12-01. ^ Mandel, Ken (2006-04-06). “Rollins’ hitting streak over at 38”. Philadelphia Phillies. http://philadelphia.phillies.mlb.com/news/article.jsp?ymd=20060406&content_id=1387074&vkey=news_phi&fext=.jsp&c_id=phi. Retrieved 2008-08-18. ^ “Single-Season Leaders & Records for Extra-Base Hits”. Baseball Reference. Sports Reference LLC. http://www.baseball-reference.com/leaders/XBH_season.shtml. Retrieved 2008-08-18. ^ “Lenny Dykstra Statistics”. Baseball Reference. Sports Reference LLC. http://www.baseball-reference.com/d/dykstle01.shtml. Retrieved 2008-08-18. ^ “Kid Gleason Statistics”. Baseball Reference. Sports Reference LLC. http://www.baseball-reference.com/g/gleaski01.shtml. Retrieved 2008-08-18. ^ a b c d e f “John Coleman Statistics”. Baseball Reference. Sports Reference LLC. http://www.baseball-reference.com/c/colemjo01.shtml. Retrieved 2008-08-18. ^ “Curt Schilling Statistics”. Baseball Reference. Sports Reference LLC. http://www.baseball-reference.com/s/schilcu01.shtml. Retrieved 2008-08-18. ^ “Single-Season Leaders & Records for Shutouts”. Baseball Reference. Sports Reference LLC. http://www.baseball-reference.com/leaders/SHO_season.shtml. Retrieved 2008-11-13. ^ “Kent Tekulve Statistics”. Baseball Reference. Sports Reference LLC. http://www.baseball-reference.com/t/tekulke01.shtml. Retrieved 2008-08-18. ^ “Phillies Single Game Records”. Philadelphia Phillies. http://philadelphia.phillies.mlb.com/phi/history/single_game_records.jsp. Retrieved 2008-08-18.